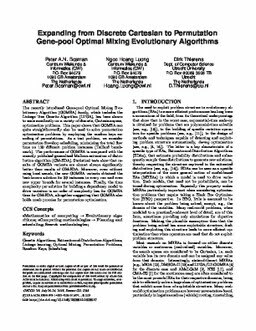 The recently introduced Gene-pool Optimal Mixing Evolutionary Algorithm (GOMEA) family, which includes the Linkage Tree Genetic Algorithm (LTGA), has been shown to scale excellently on a variety of discrete, Cartesian-space, optimization problems. This paper shows that GOMEA can quite straightforwardly also be used to solve permutation optimization problems by employing the random keys encoding of permutations. As a test problem, we consider permutation flowshop scheduling, minimizing the total flow time on 120 different problem instances (Taillard benchmark). The performance of GOMEA is compared with the recently published generalized Mallows estimation of distribution algorithm (GM-EDA). Statistical tests show that results of GOMEA variants are almost always significantly better than results of GM-EDA. Moreover, even without using local search, the new GOMEA variants obtained the best-known solution for 30 instances in every run and even new upper bounds for several instances. Finally, the time complexity per solution for building a dependency model to drive variation is an order of complexity less for GOMEA than for GM-EDA, altogether suggesting that GOMEA also holds much promise for permutation optimization.